Time Saving Tips for Excel, written by two long-time Excel trainers, offers over 500 time saving tips, tricks and shortcuts to help you use Excel more efficiently. If you're new to Excel, you'll learn the fundamentals of creating, saving, editing, formatting and printing spreadsheets. If you've used Excel for awhile but want to become more proficient, you'll benefit from the hundreds of tips on formatting cells, creating charts, entering formulas or digging deep into your data. Excel power users will appreciate finally having all of Excel's hidden tips, tricks and shortcuts in one concise, informative and entertaining little book. You'll find tips on formulas and functions, custom number formats, data validation, charting, custom lists, pivot tables and more. This is a book about Excel that's easy to follow and fun to read. 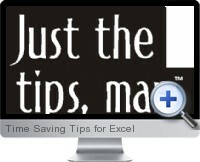 Time Saving Tips for Excel is full of hidden but incredibly useful Excel tricks that even long-time users don't know. Whether you're just getting started or have been using Excel for years, this little flip-book is an essential companion to Excel. Get up to speed on new features quickly. Spend a fraction of the time on repetitive tasks. Work with multiple worksheets and workbooks effectively.